Uncharted 4: A Thief’s End is a beautiful game on its own. Add an extensive Photo Mode and a creative player base and it becomes an art engine, generating an endless array of eye candy. Here are some of our favorites. With plenty of filters, tools and even the avility to remove characters from scenes completely, Uncharted 4's Photo Mode is one of the coolest screenshot tools to grace a console game. The PlayStation Blog has got some great tips for using it. We’re more concerned with results. Note: Visual Uncharted 4 spoilers may be included in the gallery below. First up we’ve got several images from NeoGAF, where they’re hosting a Photo Mode contest for PSN codes. Redditor Jv_ says he’s spent about half his time playing the game messing about in Photo Mode. He’s made some beautiful messes. While Jv_ leaned towards black and white, Redditor dogofhavic loves his colors. Redditor fragmaster3000 took at least 150 photos during his play through of the game. We’ll finish things off with a selection of the prettiest photos uploaded to Twitter via the PlayStation 4's Share function. 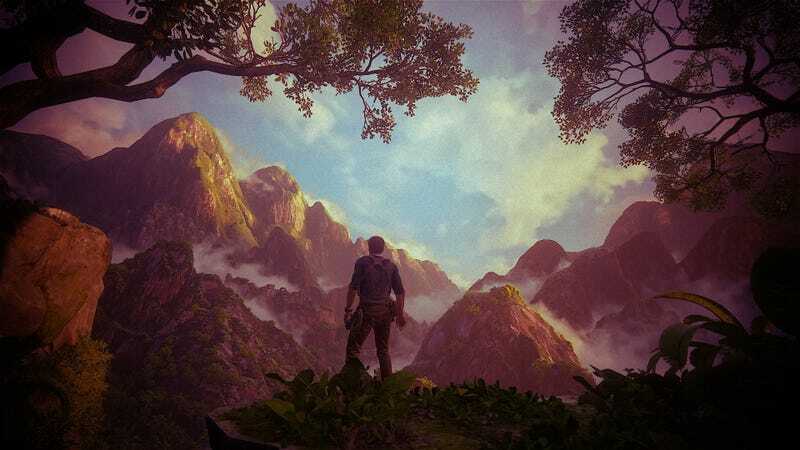 Feel free to share your favorite photos from Uncharted 4: A Thief’s End in the comment section below.